We’re through Thanksgiving and heading right towards Christmas and New Year’s, which means it’s a perfect time for the annual Baseball Hall of Fame debate. On Jan. 24, Jack O’Connell, Secretary/Treasurer of the Baseball Writers’ Association of America (BBWAA), will once again have the honor of announcing the latest inductees. “The more we Hall of Famers talk about this — and we talk about it a lot — we realize we can no longer sit silent,” Morgan wrote. “Many of us have come to think that silence will be considered complicity. Or that fans might think we are ok if the standards of election to the Hall of Fame are relaxed, at least relaxed enough for steroid users to enter and become members of the most sacred place in Baseball. We don’t want fans ever to think that. “We hope the day never comes when known steroid users are voted into the Hall of Fame. They cheated. Steroid users don’t belong here. “But it still occurs to me that anyone who took body-altering chemicals in a deliberate effort to cheat the game we love, not to mention they cheated current and former players, and fans too, doesn’t belong in the Hall of Fame,” he wrote. “By cheating, they put up huge numbers, and they made great players who didn’t cheat look smaller by comparison, taking away from their achievements and consideration for the Hall of Fame. That’s not right. “And that’s why I, and other Hall of Famers, feel so strongly about this. Of the 1,069 propagandizing words sent Tuesday to Baseball Hall of Fame voters urging them to just say no to steroids, none encapsulated the museum’s winning combination of self-reverence and tone-deafness quite as blatantly as the six in which it called itself: “The most sacred place in Baseball.” If, by sacred place, the Hall means one in which racists, wife beaters, drunks, gamblers and purveyors of manifold moral turpitude otherwise are celebrated, well, Cooperstown is a shining beacon of divinity set upon a hill of hypocrisy. I agree with Morgan in that I don’t like the idea of PED users in the Hall, but that is up to whoever is voting and if I were in his position, I would not use my standing to try to influence the voters. Rather than give up his vote, Passan should just vote the way he has always intended to and ignore the opinions of others. Back to the bigger debate: whose name should be read by Jack O’Connell on Jan. 24 for induction into the Hall of Fame during the Summer of 2018? Joining the list of carryovers from last year are Braves’ third baseman Chipper Jones and his outfield teammate Andruw Jones, Indians’ first baseman/DH Jim Thome and his former teammate and shortstop, Omar Vizquel, and White Sox/Astros slugger Carlos Lee. For pitching there is former Twins’ Cy Young winner Johan Santana, 25-year veteran Jamie Moyer, Marlins World Series hero Livan Hernandez, Cardinals’ veteran Chris Carpenter, journeyman Kevin Millwood, and the Cubs’ Kery Wood and Carlos Zambrano. And, not to be left out, there are former Yankees World Series champions Hideki Matsui and his fellow (Red Sox) outfielder Johnny Damon. Despite long Major Leaguer careers, Chipper – but not Andruw Jones – has a shot at being honored in Cooperstown. Born Larry Wayne Jones, Chipper is one of the best-hitting third basemen of all time. He lived up to his high school billing that made him the No. 1 overall pick in the 1990 MLB Amateur Draft. After missing all of the 1994 minor league season due to an injury, Chipper hit 23 home runs and drove in 86 runs in his rookie season of 1995. His accompanying .803 OPS was the lowest of his career. That’s a pretty remarkable stat, considering he played for 19 years and at age 40. Jones’ final numbers include 468 home runs, 1,623 RBI, 1,619 runs scored, 2,726 hits, 540 doubles, and a .303/.401/.529 slash line. He played in six NL Champion Series and three World Series, and earned a title ring in 1995. There has been some concern that some Tweets that Jones made about the Sandy Hook shooting massacre could cause him to lose some votes. I don’t think that will be the case since it seems he overreacted to a false story and wasn’t actually doubting that the 2012 incident took place. Thome is one of the greatest sluggers of his generation and of all-time. He is one of nine players to eclipse 600 home runs and his 612 are the eighth best total of all-time. Some fans and media may want to discount Thome’s accomplishment since he hit his 600th home run in his 21st year in the Major Leagues, and there is a misperception of how many games he appeared in as the DH. In fact, Thome was the DH in less than 1/3 of his 2,599 games played and appeared in 1,106 games as a first baseman (he also played 492 games at third base). The Illinois native completed his career with 1,619 RBI, 1,583 runs scored, 451 doubles, 2,328 hits, and a .956 OPS. He played in a Champion Series in both leagues and in one World Series. Employing defensive metrics and statistics is one of the most difficult measures to use to evaluate a player for the Hall of Fame, because defensive measurements are not as tangible as offensive statistics. At first glance, Omar Vizquel falls into this “grey area” category. Vizquel’s won 11 Gold Glove Awards for fielding excellence in a 24-year career. He won nine of the awards consecutively, from 1993 through 2001. While the Indians’ official scorer was quite generous in handing out hits instead of errors, there’s no question that Vizquel was one of the best defensive players the game has ever seen. That being said, Vizquel handled a baseball bat quite well. He collected 2,877 hits and 1,445 runs scored while striking out more than 65 times in a season just once. Vizquel stole 404 bases, with half of his thefts coming in a six-year period (1995 – 2000). If you compare Vizquel to another defensively minded middle infielder, second baseman Bill Mazeroski, the shortstop is a cinch for election. Mazeroski had a lifetime .299 on-base percentage and a .667 OPS over a 17-year career. Damon became very popular as both a member of the Boston Red Sox (four yrs) and New York Yankees (four yrs). Before that, they loved him in Kansas City (six yrs) and Oakland (one yr). His 18-year career, which finished in Detroit, Tampa Bay, and Cleveland, produced 2,769 hits, 1,668 runs scored, 408 stolen bases, a .783 OPS, and a couple of All-Star appearances. Just 231 hits shy of the magical 3,000 mark, Damon is a perfect example of a player who might not have gotten the necessary votes even had he reached the 3,000 hit plateau. Damon’s overall career wasn’t Cooperstown-worthy, even though he has a pair of World Series rings. Having only reached 200 hits during one season, he would have needed to produce more hits over his career or play more years to collect 3,000 hits. For comparison’s sake, the Yankees Bernie Williams is also not a Hall of Fame player. Like Damon, he’s very good, but not good enough. During a 16-year career, “Bern, Baby Bernie” knocked in 1,257 runs and scored 1,366. He banged out 2,336 hits and posted a .292/.381/.477 split, compared to Damon’s /.284/.352/.433 line. Williams also owns four World Series rings, five Gold Gloves, and he was a five-time All-Star. San Diego Padres longtime Closer Trevor Hoffman (74%) and Expos/Angels outfielder Vladimir Guerrero (71.7%) could see the finish line in last year’s voting, but both came up just short of the required 75% of the votes. So, they are no-brainers for this season. The third highest total on the 2017 ballot belonged to Edgar Martinez (Seattle Mariners), who garnered 58.6% of the votes. Martinez’s career has been one of the more interesting debates among the members of the BBWAA. Some point out that as primarily a DH, he isn’t a complete enough player to gain entrance. Others see him as one of the purest hitters the game has produced. Martinez is a hitter’s version of a very good defensive player. In an 18-year career that included the strike-shortened 1994 season and other years shortened by injuries, Martinez had 2,247 hits in 2,055 games played. He scored 1,219 runs, drove in 1,261, and collected 1,261 free passes. He had six All-Star appearances, won five Silver Slugger Awards, and two batting titles. A lot of Yankees fans despised Martinez, especially when his hit won the 1995 ALDS battle between the Yankees and Seattle Mariners. But, Martinez was one of my favorite non-Yankees, of which there aren’t many. I marveled at how he handled the bat and lined hit after hit. His .933 career OPS is comprised of a .418 on-base percentage and a .515 slugging percentage (not to mention his .312 lifetime batting average). 2018 Ballot? : No, but getting closer. 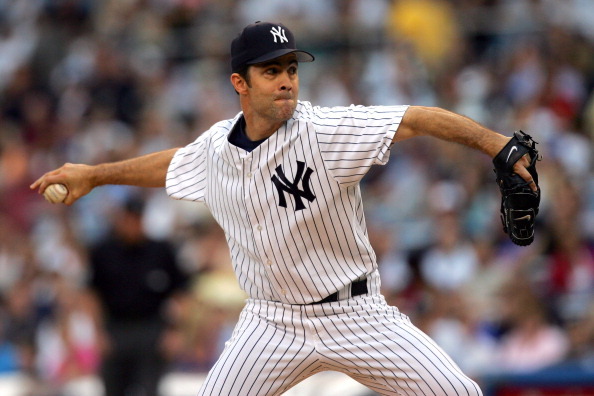 Mike Mussina received 51.8% of the votes on last year’s ballot, good enough for sixth place. The tally represented a 20.7% increase from 2016 (43%) and a 115.83% uptick from 2015 (24%). “Moose” amassed 270 wins in an 18-year career split between the Yankees (eight yrs) and the Baltimore Orioles (10 yrs). Among his individual accomplishments were double figures in wins in all but his very first season in the Major Leagues. He won 15 games or more 11 times, including 20 wins in his final season, when he also led the AL with 34 starts. Though he never won a Cy Young Award, he finished in the top-5 in voting seven times and had one sixth-place finish. Mussina struck out 2,813 hitters and also helped himself out defensively, which earned him six Gold Glove Awards. As for World Series rings, some players are just a victim of circumstances, and that’s the case with Mussina. The Yankees and Mussina were three outs away from a ring in 2001 until Mariano Rivera had a rare meltdown against the Arizona Diamondbacks. Also, Mussina pitched heroicly in relief in Game 7 of the 2003 ALCS, keeping the Yankees in the game until (present day) manager Aaron Boone hit his pennant-winning home run. A big intangible for Mussina is that he pitched his entire career in the rough AL East and had to face a lineup that included a DH the majority of the time. 2018 Ballot? : No, but closer. Roger Clemens (19.6%) and Barry Bonds (21.4%) each saw significant increases from the 2016 to 2017 balloting that put them near 55% of the total ballots. It remains to be seen whether or not the upward trend will continue. Those are the only two PED-related players currently on the ballot that have a chance. Mark McGwire is already gone, and Sammy Sosa and Manny Ramirez will be soon to follow. Curt Schilling garnered 45% of the voting last year and will be interesting to follow in this year’s vote. A political conservative, Schilling has made some controversial remarks the last couple of years, and was fired by ESPN for comments he made on Twitter. That is, if I had one and it counted. And remember, just 48 more shopping days until the BBWAA announcement, and one more year until Rivera is on the ballot.